Run the cFos Outlook DAV installer to add cFos Outlook DAV as Outlook Add-in. It is tested with Outlook 2016 and 2013, but should also work with Outlook 2010. Start Outlook and create a new calendar folder. Now right-click on this folder and choose "Sync with CalDAV". You can now configure the folder by right-clicking it again and selecting "Config CalDAV Sync". Task and contacts synchronisation work exactly like appointment synchronisation. Right-click on the task folder and configure the URL and user name/password as with appointments. You can use the same URL, user name, password as with your appointments. However, for tasks this does not work with Google (see below). 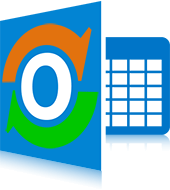 When you start Outlook, cFos Outlook DAV tries to synchronize all data of your Outlook folders with the CalDAV/CardDAV server. If something on the server has changed, the changes are reflected in your Outlook folders. So data added or modified on the server will be added or modified in your local folder. Data deleted on the server will be deleted in your local folder. This synchronisation is done every n minutes depending on the sync interval you specified in the folder setup. Whenever you add, change or delete an event in your local folders you can update the server data by using the "Sync All" button in the ribbon. You should consider doing the same before closing Outlook. The folder configuration data is stored in the directory C:\Users\YOUR_USERNAME\AppData\Local\cFos\outlook_dav. The directory C:\ProgramData\cFos\outlook_dav contains folder_setup.hta, so you can later change your configuration. Passwords are stored with a preceding "!" and encrytped on-the-fly as soon as cFos Outlook DAV needs them. In C:\Users\YOUR_USERNAME\AppData\Local\cFos\outlook_dav you can also find a file trace.txt with a log of the last recent sync operations. cFos Outlook DAV uses the Internet Explorer's proxy settings. You can change them in the Control Panel -> Network and Internet -> Browser Settings.